The Victorian mountaineer Edward Whymper is best-known for making the very first ascent of the Matterhorn in 1865. 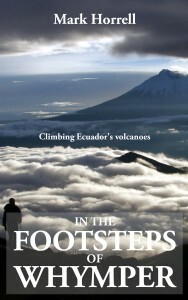 Less well known is that in 1879 he set sail across the Atlantic bound for the high Andes of Ecuador, where he made first ascents of many of the country’s highest mountains, most of which are volcanoes far higher than anything he climbed in Europe. He was a hard man to impress. He described the peaks he climbed as hilly rather than mountainous, citing the fact that it’s possible to get a donkey up one or two of them as evidence of their inferiority over the mountains of the Alps. But this didn’t bother me. I describe myself as more of a hill walker than a climber. Whether heaving myself up with an ice axe or straddling a donkey, to me the views are just as good, and I resolved to follow in Whymper’s footsteps and climb some of the same mountains.